halloween is over and i did not plan to post about either of these things. until i tasted them. whoa whooooa wHOA. rudeness is the worst, and it would be rude of me not to share. you must have leftovers, stashes of candy here and there. 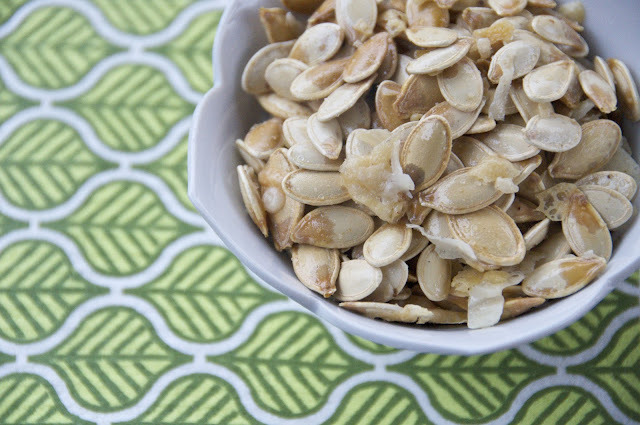 and surely you are planning on eating a lot more pumpkins this fall. halloween is just the beginning, right? so here we are, on one end we have pretzels and reeses and sprinkles, and on the other we have truffle oil. a little bit of trashy, a little bit of classy. britney & k-fed + william & kate = one party i'd like to attend. around 2 o'clock yesterday i started to go a little sugar high psycho. i did really intense black eye makeup around only one eye and couldn't control making weird noises and communicated through shrieking at people. this is the exact moment in time that i went into the kitchen and this crazy carnival-looking-candy-crack was born. 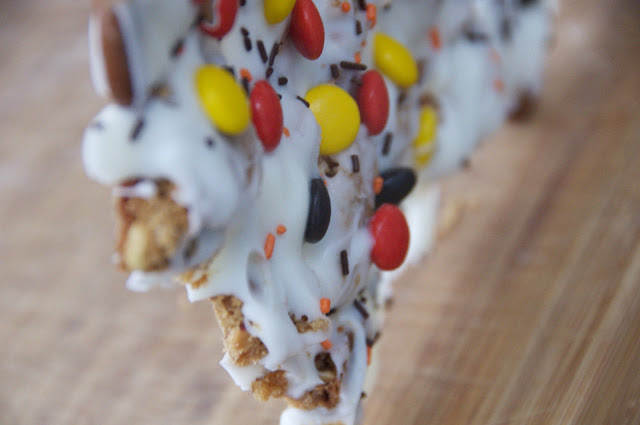 right now you probably have all the stuff in your pantry to make your own version of halloween crack (bark). it might be the easiest thing you'll ever make. i had a few leftover peanut butter cookies so i broke those up with a bunch of pretzels and arranged them on a sheet pan. i melted vanilla candy melts and poured that over and then scattered reeses pieces and sea salt and sprinkles over the top. 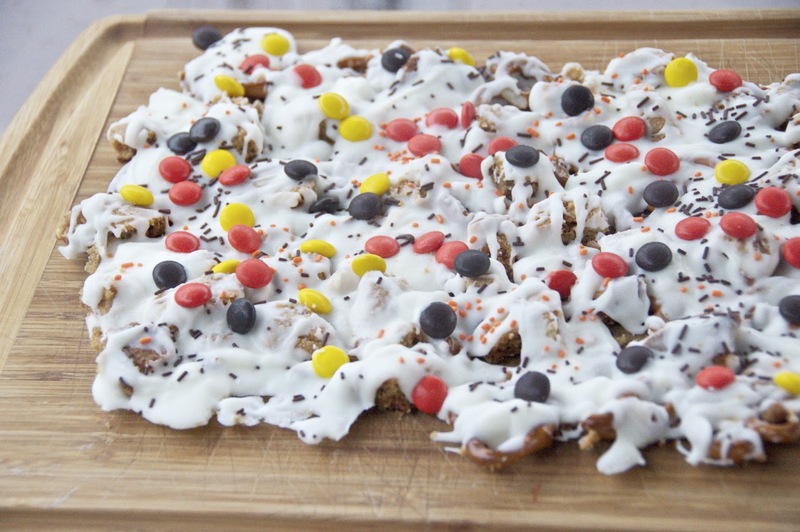 you can use whatever suits your fancy...oreos, butterfingers, heath bars, candy corn, ooooh my! also, make sure you aren't alone with a pan of this. moving on to the next addictive snacksky. we need to talk about these seeds. there is no question that they are the best seeds i've ever come upon. 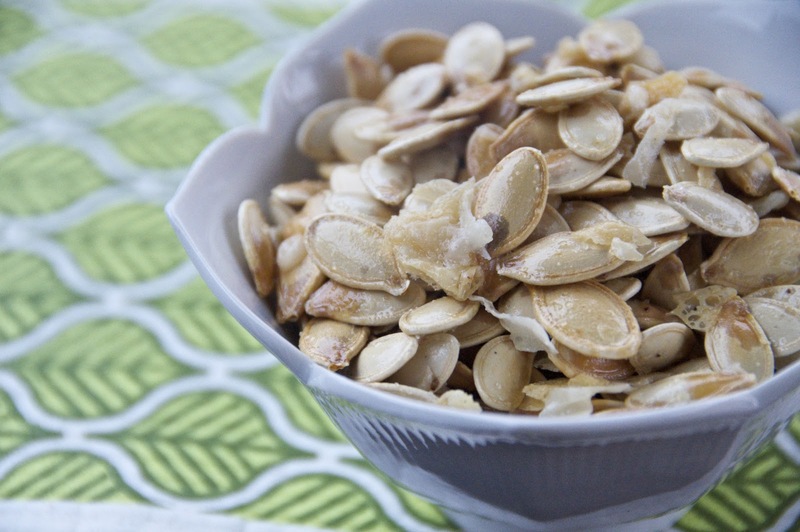 but before they go in the oven, grate some parmesan and throw that in with the seeds. second, when they're nice and roasted out of the oven, drizzle truffle oil on there and a good dose of truffle salt (both both!). why wouldn't you? alright. now i need water. *no exact measurements here. just grab handfuls and do it! line a sheet pan with foil or parchment. 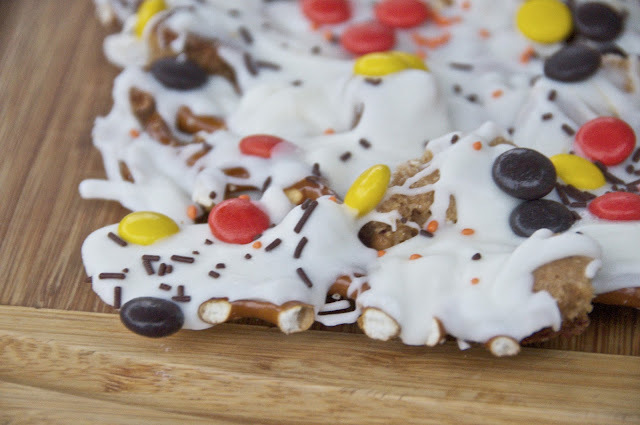 arrange broken cookies and pretzels. 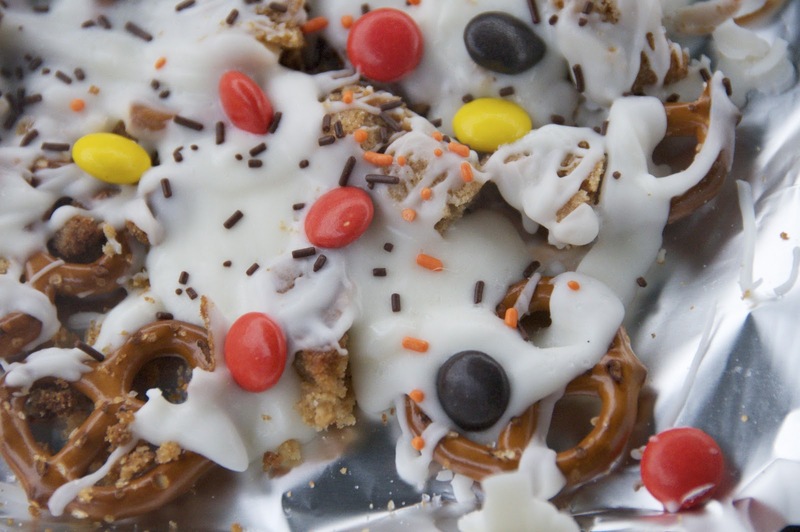 melt white chocolate over a double boiler or in a microwave and drizzle over cookies and pretzels. scatter reeses pieces and sprinkles over + a good dose of sea salt. let it set up in the fridge. preheat oven to 300. coat seeds with a bit of olive oil and some sea salt. arrange them on a baking sheet and sprinkle parmesan over. roast for about 30 minutes til crisp. drizzle a little truffle oil over and mix well. sprinkle with a few pinches of truffle salt. bon appetit! oh crap. there is saliva all over my computer. It's at times like these I really wonder why I bothered to restrain myself from going to Target yesterday to stock up on Halloween leftover candy. we all know I'm going today. Need this. Both of these look amazing - thank you thank you! !